Successfully Added Universal Portable Battery Bank "Ampacity" - 20000mAh to your Shopping Cart. This portable battery pack comes with an amazing 20,000mAh of power. Packing enough juice to fully charge every electronic device you own… and then some! Coming with 13 (8 laptop and 5 cell phone) interchangeable adapter tips, the “Ampacity” can charge virtually every electronic gadget you own. To ensure full compatibility with a wide variety of electronic products, such as; MP3/MP4 players, portable DVD players, mobile phones, or any other USB powered device using the built-in 5V USB port, the voltage can be set to the desired level. Built as small and light as possible, the “Ampacity” battery pack is extremely portable and perfect to take with you wherever you go. Put one in your car for those long road trips to recharge all your electronic devices while you drive. Or place one in your notebook bag and use your computer for up to an additional 4 hours when you need it the most. The best part about it is that you can charge all of your electronic devices without having to bring along messy cables and adapters. Just select the correct adapter tip, plug it in, and you’re ready to go! Charging your electronics while on-the-go has never been so easy. Featuring overload protection and short circuit protection, the “Ampacity” makes sure your electronic devices always receive the correct amount of electricity by regulating the current flow. If you want to power your expensive electronics on-the-go, then this battery pack will help you do that, all day long, and all while keeping your electronics 100% safe from harm. Brought to you by the leader in wholesale cell phone and laptop accessories, Chinavasion. Built-in voltage selection button and LED indicator that displays the current voltage setting and charge status. This charger does not charge USB devices that use USB power as a secondary power source. For example, if your device has a main power supply that is not a USB connection, then you will not be able to use the USB port to charge that device. Instead, you will need to use one of the supplied adapter tips to charge that device. 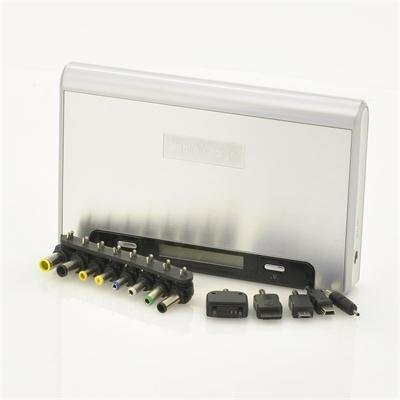 The included laptop adapter tips come in the following sizes: 4.0x1.7mm / 4.75x1.7mm / 5.0x1.0mm / 5.5x1.7mm / 5.5x2.1mm / 5.5x2.5mm / 6.3x3.0mm / 6.0x1.0mm. We can not guarantee compatibility with every laptop or electronic device. Please check the power connector size of your device first. A real big powerhouse for feeding any sort of power hungry digital devices, be it cellphone, mp3, mp4 player or even laptops. I can term it as lifeline of a laptop. You will be amazed to see that it gives much more backup time than what internal laptop battery gives to laptop. The only thing with which I am not happy that I could not charge my new Ipad with this device. Очень хороший , качественный продукт. Спасибо. 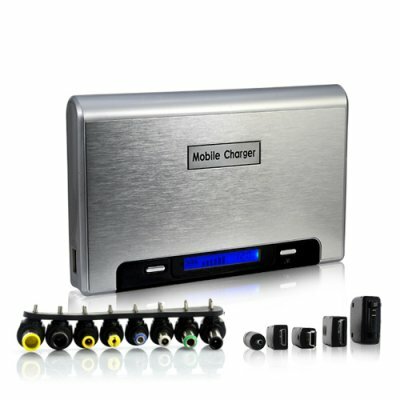 The mobile charger is easy to use and very powerful. You can charge your cell phone or everything that uses 12,16, or 19 Volts.